Taking the time to lay out an Infantry Guidon will result in a superior design that satisfies the customer. Each object is measured and marked with removable tape to ensure a symmetric and evenly spaced design. Every company has a pricing policy that is part of their business model. Our pricing policy favors high quality over low cost. Sorry, but we are not a discount–cheap picture framing company! Why? Because a cheaply framed guidon is something a discontented customer will stick under the bed or stash away in the closet or the attic–ashamed to display. On the other hand, a quality framed guidon is one that will be displayed proudly in a prominent place for all to see! Our proximity to Fort Stewart, Hunter Army Airfield, the Kings Bay Naval Base, Savannah, Georgia, and Richmond Hill, Georgia has provided us with years of framing experience in our retail picture frame shop’s operation. As experienced custom picture framers, we’ve learned a lot from the military about their desires to receive quality, custom framed guidons. The most important lesson we’ve learned is that a customer gets what they pay for. And, that a customer will pay for quality. It’s a common cliché to say that “you get what you pay for.” Just like a cliché, some people often take a low-priced guidon for granted. Most people look at a framed guidon and assume the piece came together flawlessly, and that it consists of the highest quality for a cheap price. Unfortunately, nothing can be further from the truth. You can have a quality framed guidon at an affordable price. However, a cheaply framed guidon will not reflect quality in its design, workmanship, or the components making up the framed project. A cheap guidon is a cheap guidon in many aspects. A cheaply framed guidon will reflect poor design. The first impression of a cheaply framed guidon will be the lasting impression that someone did not take their time to do it right. Let’s face it: recognition for a job well done is appreciated by the customer. Also, no one wants to receive a framed guidon as a gift that diminishes that recognition. That is why a quality framed guidon given as a parting gift to an outgoing officer, to an NCO, or a member of the staff, is greatly appreciated by the recipient. Changes in command are also opportunities to provide a quality guidon to a departing officer or NCO as a token of appreciation. The desire to preserve the memories of a distinguished military career is another reason soldiers, sailors, airmen, and Marines seek us out for our quality picture framing services. They will spend their own money to have us custom frame a guidon that includes sentimental objects surrounding the guidon, rather than display a cheaply framed guidon given to them as a parting gift. Because we believe in providing quality, it would be a disservice for us to criticize cheap frame jobs without explaining the negative aspects of accepting them. Often, what’s behind the frame’s glass in a framed guidon will result in damage to your treasured heirloom objects. Our concern for your heirlooms is the reason we offer a comparison between quality framing versus cheap framing. 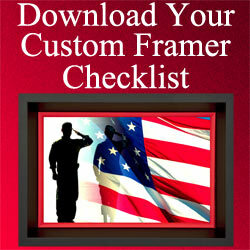 A quality frame job reflects the pride in oneself with displaying important aspects of their military career. A quality framed guidon does not diminish the displayed objects or the guidon. Often cheaply framed guidons are furnished as an expedient parting gift. Instead of providing a cheap, expedient framed guidon, we suggest that you honor the recipient with something that truly reflects their character and military career. Our framed guidons are something special that often brings the toughest soldiers to tears. They see what their fellow soldiers have proudly done for them with one of our quality framed projects. In order to make a wise decision about your framing options, we invite you to read the following comparison. This leads to an important consideration: One unfortunate negative aspect of a cheaply framed guidon is its lack of aesthetic appeal. For example, a quickly assembled cheap framed guidon will lack balance in the design that goes into placing the objects around the guidon. Knowing how to balance the objects in the frame, and space the objects, requires time for measuring and assembly. Also, achieving the right mat colors and dimensions surrounding the guidon and the objects requires time, knowledge, and experience. A cheap framed guidon often has the guidon and its objects stuffed into a standard size frame. The disproportionate dimensions in the arrangement of the mat, objects, and the guidon will not look professional and lacks visual quality. A Cheap Framed Guidon Will Have A Short Life! A cheaply framed military guidon will not have a long life! Cheaply done guidons will be made from materials that will not protect the guidon, the mats, or the objects from fading due to UV light and acid damage. Any framed objects with sentimental value are at high risk in a cheap frame of being permanently damaged. The Pros And Cons Of Using Us Versus A Cheap Framing Competitor. Our projects utilize conservation quality framing materials. This includes 99% UV protected glass or acrylic, all acid-free mats, acid-free foamboard, and acid-free dust covers. Any images that we reproduce as part of the guidon framing product are printed on archival paper with archival inks. 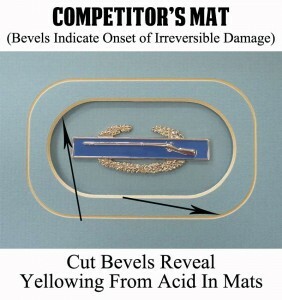 The bevels on an acid-free mat will remain white. 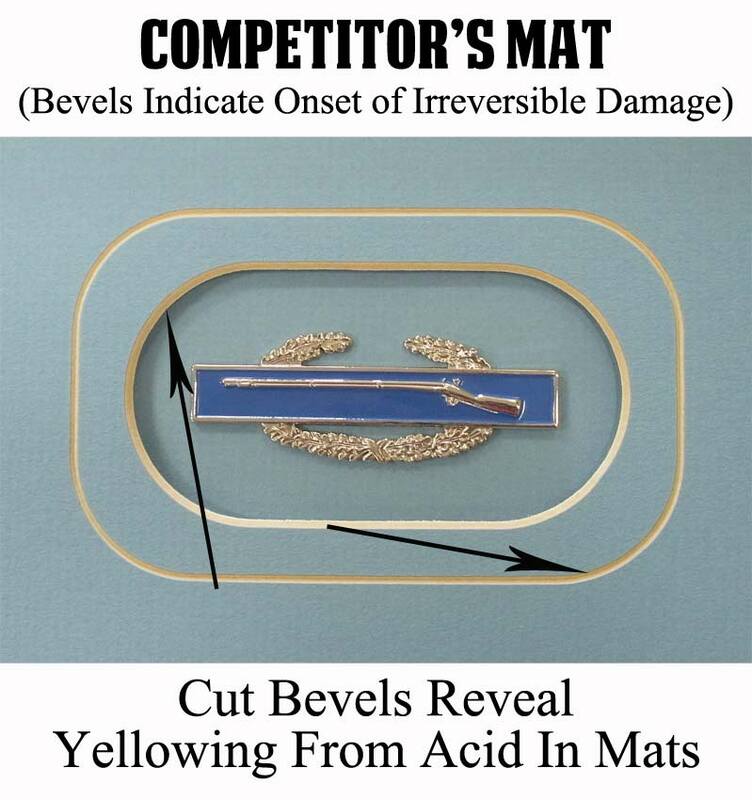 The bevels on an inferior, acid mat will yellow with time. The yellowing indicates the presence of acid in the mats. With time, acid mats will cause acid burns to documents and other memorabilia framed inside the mats. Always ask a framer if they use acid-free mats. Our acid-free mats and materials will last a lifetime. A cheap picture framer will employ acid mats that will result in acid burns to the objects surrounded by the mat. Also, the inside mat bevels on a cheap frame’s project will turn yellow to brown within a few years. The acid-free bevels on our mats will remain white and crisp–an indication of our quality. Our prices separate us from a lot of online picture framers. First and foremost, we do not provide a “cheap” guidon framing alternative to our high standards of quality. We only provide the highest quality workmanship and conservation materials. At the same time, we understand that budgets come into play with parting military gifts. However, a cheaply framed guidon does a huge injustice to the recipient. Our experience has shown us that our competitor’s cheaply framed guidons often come back to us as a redo for the entire frame because the recipient is ashamed of what was presented to them. The poorly done framed guidons get tossed in the closet. Or, they never get hung because the recipient isn’t proud of what his friends and colleagues have given him. Instead of focusing on high volume, low-quality framed guidons with a quick turnover, our approach to guidon framing is totally different. 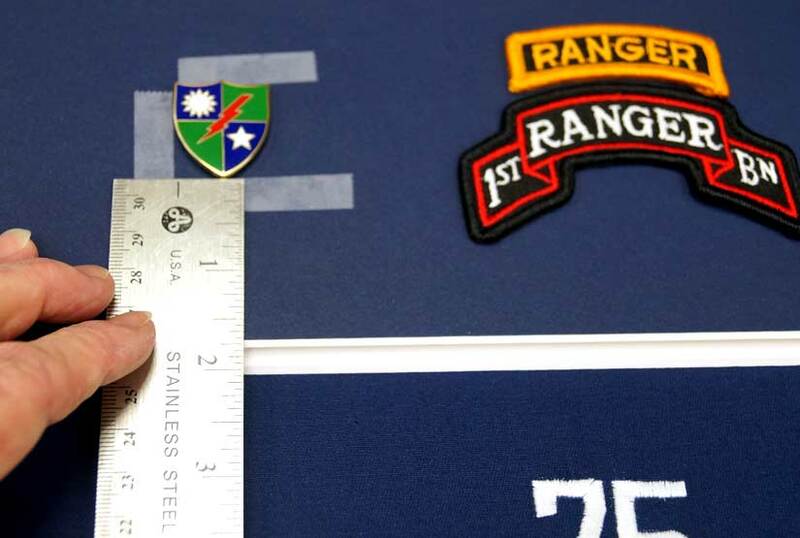 We budget the necessary amount of time and utilize only conservation materials to complete the highest quality framed guidons possible. When shopping or comparing a framed guidon proposal to other picture framers, it is important to consider several factors. Price should not be the determining factor! Please, contact us. 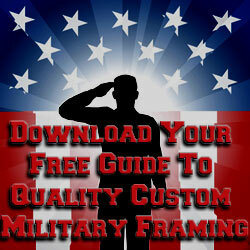 We offer high-quality custom guidon frames that you will be proud to receive, give, or display.